Should IT GRC be in your future? If it’s not, it should be. 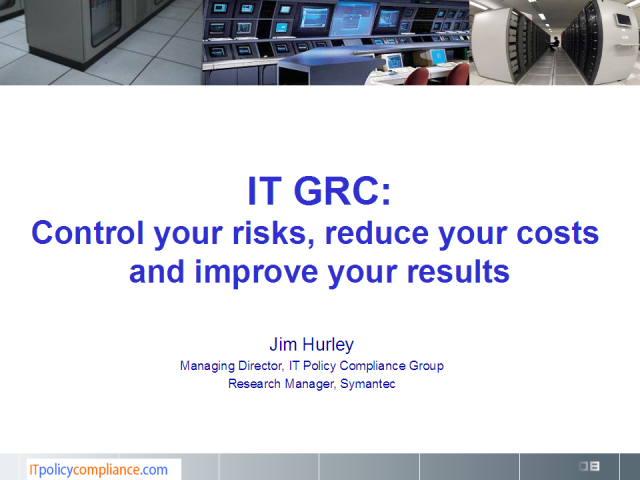 Learn what IT GRC is, why it’s important, about the practices implemented by one-in-ten organizations that are achieving the best customer retention rates, the least loss of customer data, the most uptime in IT, the lowest financial risks, and spending on regulatory compliance that is 52 percent lower than peers. Based on primary research benchmarks conducted with more than 2,600 organizations, this online seminar is a must-attend event for anyone involved in managing the value delivered by IT to the organization, controls for managing business risks and rewards from the use of IT, and optimal practices for regulatory and legal compliance.